It has been told in the chapter on the 7F.1 Snipe how B9967, the last of the original six Snipes that had been ordered for experimental and development flying, was fitted with an A.B.C. Dragonfly nine-cylinder air-cooled radial engine, and how this 'Dragonfly Snipe' was completed as early as April 1918 though the name Dragon was not adopted for the Snipe-development so powered until October of that year. (The Armistice was signed on 11 November). After trials at Brooklands, B9967 was sent to the Royal Aircraft Establishment, Farnborough, on 11 May, 1918 - little more than a month before the Dragonfly-engined two-seat Bulldog X4 unarmed flying test-bed, which went thereon 25 June. 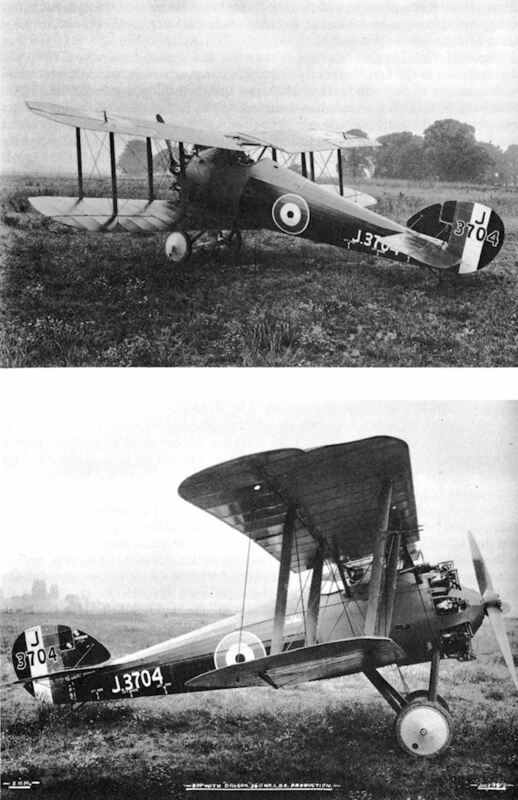 These two Dragonfly installations - in the special Snipe and unarmed Bulldog - were clearly among the first that were made; and although it initially had two Vickers guns, B9967 itself was later used as an unarmed flying test-bed. Having regard, however, to the Dragonfly's disastrous record of failure these same installations recalled unhappily the fitting, early in 1912, of an A.B.C. engine in the so-called 'Sopwith-Wright' formerly an American-built Burgess-Wright, acquired by Tom Sopwith, brought to England in 1911, and rebuilt. 'Unhappily' one says because with the A.B.C. engine of 1912, Harry Hawker (see 'Other Men's Aeroplanes') had set up a British duration record of 8 hr 23 min; whereas - although it returned some remarkable performance figures for military aircraft when it was not more or less destroying itself the later 300 hp-plus radial designed for A.B.C Motors Ltd of Walton-on-Thames by Granville Bradshaw - could not aspire in this direction. Nevertheless, at its very end in 1920 the Sopwith company was building A.B.C. motor-cycles, and production was continued by the new Hawker company. An A.B.C. Dragonfly engine, moreover, powered the Nieuport Goshawk biplane in which Harry Hawker was killed in 1921 - likewise its Sopwith Rainbow counterpart of 1920. That B9967 was sometimes called by Sopwith 'Dragon - 1st. Experimental' as well as ‘Snipe - 360 h.p. A.B.C. Engine' is indicated by photographs; and its right to a new name was surely established not by the new radial engine alone but by the fuselage of concomitantly greater length. Photographs also show how 'Dragon - Experimental No. 2', and also production Dragons, differed from the first 'Dragonfly Snipe' (B9967), the '360 h.p.' quoted for the latter's engine being both tentative and nominal. The aeroplane just styled 'Dragon - Experimental No. 2', and shown in photographs dated January 1919, was in fact E7990 which, although sometimes regarded as 'the first real Dragon' was merely another Snipe conversion. 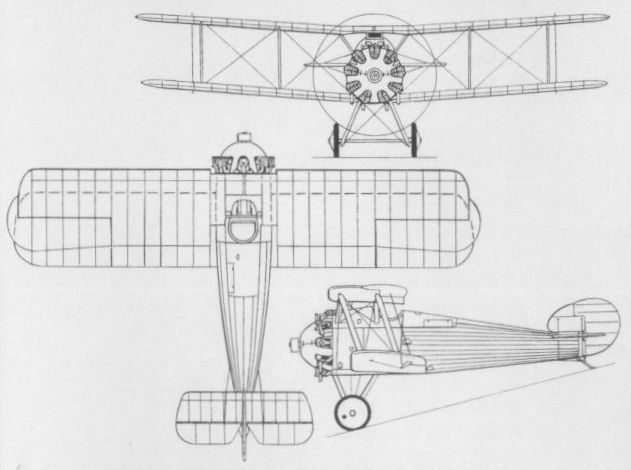 This same machine, in fact, retained the plain top ailerons and wooden centre-section struts of B9967 and other early Snipes, but differed in having the larger (and curved) fin/rudder assembly of later-production Snipes; a two-piece engine-cowling, the longitudinal joints whereof are seen in photographs; and a Badin-type petrol-delivery system, the venturi for which was on the front starboard centre-section strut. But visible details were of relatively small consequence - and Heaven knows how many modifications, to engine and airframe alike, were made to the Farnborough 'hack' B9967. The engine, of course, was the more worrisome, though even by April 1918, when that same aircraft was first completed, the Dragonfly had been ordered in great quantities, primarily - it was officially declared for use in a fighter to replace the S.E.5 and Sopwith Dolphin, both of which had the excellent though troublesome water-cooled Hispano-Suiza. (The Snipe was uncompromisingly a Camel replacement similarly with air-cooled engine). That the converted Snipe E7990 was at one time allocated to the USA may have a special significance respecting the Dragonfly engine, rather than the airframe; but though this machine seems never to have reached America it is seen, complete with engine, in Sopwith photographs taken at Brooklands in January 1919 and showing the name Dragon on the fuselage. 'The first real Dragon' though it may be considered, however, E7990 was positively not of the first Dragonfly-engined Snipe production contract, which had been awarded to Sopwith in June 1918 and specified thirty machines, numbered F7001-F7030. This contract was founded on the recognition of the far greater speed promised by the big new radial engine, which only the lifting power of the two-bay Snipe wings made a practical proposition - the Dragonfly engine weighing over 600 lb (270 kg) whereas the B.R.2. rotary weighed less than 500 lb (225 kg). It was apparent also that with electrical heating and other services the all-up weight must rise in service. Thus one has hoped to show that the Dragonfly radial engine was an element in the Snipe development and production programmes from early times - without prejudice, however, to this present separate treatment of the Dragon as a distinct Sopwith type. The true production-type Dragon had the inversely-tapered horn-balanced top ailerons of the later-production Snipes; similar (rounded) vertical tail-surfaces, with inset rudder horn-balance; a tailplane adjustable over a range of 0 deg 10 min to 3 deg 50 min - which was less than on the Snipe; and the longer fuselage, which gave the impression of being longer still when bearing a four-figure J registration - so 'modern-looking', like J3704 here shown! There were alterations in cowling details, and the muzzle attachments of the two Vickers barely cleared the valve gear on the Dragonfly engine's top cylinder. Though this latter distinction applied equally to B9967 and E7990, the ammunition ejection chutes were re-arranged on true production Dragons. Near the attachment-point of the starboard rear centre-section strut the steeply-sloping fuselage decking was cut away to a greater degree than to port; and the cockpit itself was deepened by virtue of a deeper fuselage section behind the coaming. In this same area there was an oblong door, appreciably behind the cockpit on the port side. The cowling alterations seemingly included a gap behind and below the propeller hub, partially exposing the generators for the Constantinesco gun-synchronising gear and affording accessibility for timing purposes. The guns, as on the Snipe, were of the Vickers Mk.I* (Mark One, star) pattern, with a 1.8 in Aldis tubular optical unit - magnification sight bracketed from the fore-and-aft tube that crossed the centre-section cut-out, though this sight demanded no windscreen cut-out or perforation (as on B9967) for no transparent windscreen was fitted - the fuselage decking being formed accordingly, as intimated, and coming almost to a point, located just in front of the cockpit. Additionally, there were the usual ring-and-bead sights. 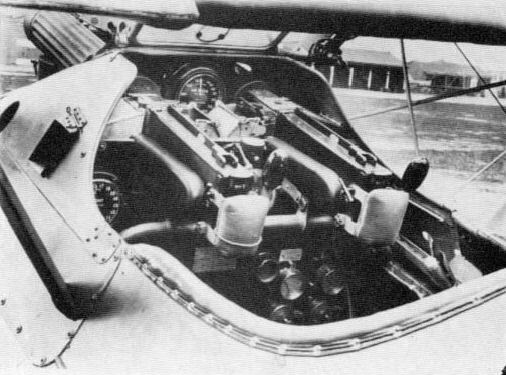 Thus it appears true that in some respects at least the production Dragon followed very early Camel practice - by getting the gun-muzzles close up against the propeller and thus, theoretically at least, simplifying synchronising, and also by making the decking (scuttle, hump or point) serve in some degree instead of a conventional transparent windscreen. One further point to make concerning armament is that although the protective pads on the rear ends of the guns - and the loading handles - are clearly visible in both the 3/4-rear view of J3704 and in a now-familiar close-up of the gun installation on Dragonfly Snipe B9967, in the latter there are no trigger motors on top of the guns, as are apparently fitted on J3704 (far forward on the rear covers). The point is possibly not significant - except for the fact that the RAF standardised on C.C. hydraulic synchronising gear (involving the trigger motors, which were really plungers acting against stiff springs) whereas the Americans and others (including some quite strong elements in Britain) favoured mechanical gear. The particular Dragon that finally reached the USA, where it was flown at McCook Field as Project Number P-149, was J3628, which had the asymmetrical top decking forward of the cockpit and was apparently in essence a standard RAF model. It seems to have survived until January 1926. In the United Kingdom, development work on the Dragonfly engine (and production likewise) continued after the Armistice; and though the Sopwith Dragon was certainly deemed to be a standard RAF fighter in 1921 it never equipped a squadron before being declared obsolete in April 1923. Nor does the intended unarmed two-seater version, which Sopwith had designed by April 1920, seem to have materialised, the absence of armament on a modified production-type Dragon at the Royal Aircraft Establishment (the aircraft having heater-muffs on the carburetter air-intakes jointly with drooping exhaust tail-pipes which collected from the lower group of cylinders) having no apparent connection with this variant. Though a number of Nieuport Nighthawks (originally designed for the Dragonfly engine) were later re-engined with either the nine-cylinder Bristol Jupiter or the fourleen-cylinder Armstrong Siddeley Jaguar radial, Sopwith Dragons were not so converted. 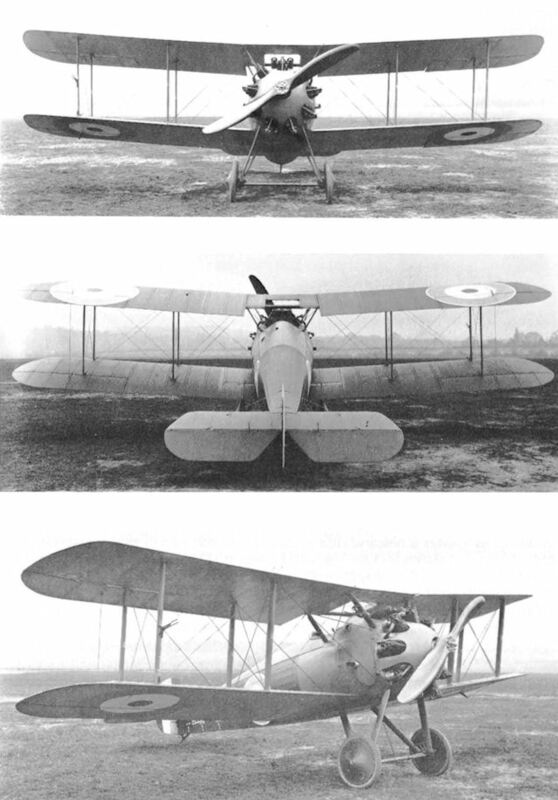 Even so, it is worth noting that the original (two-bay) form of the Hawker Woodcock (1923) was fitted with an engine of each type, and that in tail design, as well as in other respects, bore a resemblance to Sopwith's decidedly reluctant Dragon. The number of Dragons completed is not known, but all were Sopwith-built, the orders placed with the company being: F7001-F7030 and J3617-J3916. Of neither batch is precise production known, though of the second J3809 has been recorded. Some airframe parts may have been used for Snipes or Salamanders, and orders for many Dragons from other companies were cancelled. Span 31 ft 1 in (9.5 ml: length 21 ft 9 in (6.6 m); wing area 274 sq ft (25.5 sq m). Empty weight 1.405 lb (637 kg): maximum weight 2,132 lb (967 kg). Maximum speed below 10,000 ft (3.050 m) 150 mph (240 km h); maximum speed at 15,000 ft (4,570 m) 141 mph (227 km/h); climb to 10,000 ft (3,050 m) 7 min 30 sec; climb to 15,000 ft (4,570 m) 13 min; service ceiling 25,000 ft (7.600 m). The Dragon was a development of the Snipe fitted with the 360-h.p. A.B.C. Dragonfly IA radial engine in place of the B.R. 2 rotary. The prototype (E 7990) was a converted Snipe and was followed by a batch of production aircraft during 1919, but the type never entered squadron service with the R.A.F. Max. speed, 150 m.p.h. Service ceiling, 25,000 ft. loaded weight, 2,132 lb. Span, 31 ft. 1 in. Length, 21 ft. 9 in. Dragon. This Snipe development of 1918 retained the same armament, and this can be said to have fitted like a glove, for the muzzles of the guns barely cleared the valve gear on the top cylinder of the Dragonfly engine. The sixth and last prototype of the Snipe was fitted with the 320 hp A.B.C. Dragonfly nine-cylinder radial engine as the Snipe Mk II. Despite the shortcomings of this engine, it endowed the Snipe with an outstanding performance when it could be persuaded to function efficiently, and, with the Dragonfly’s faults still to be recognised as incurable, 30 Snipes were ordered with the A.B.C. engine on 3 May 1918. Assigned the name Dragon, these were delivered in June and July 1919, the production prototype having appeared in the previous January. The Dragonfly-engined Snipes were produced in parallel with aircraft built from the ground up as Dragons, these having horn-balanced upper ailerons and the 360 hp Dragonfly la engine, armament comprising the standard pair of synchronised 0.303-in (7,7- mm) guns. About 200 of a 300-aircraft contract were completed and efforts to cure the engine’s troubles continued until the autumn of 1921, the Dragon, officially adopted at that time as a standard RAF single-seat fighter, never being issued to a squadron and being officially declared obsolete in April 1923. Max speed, 105 mph (241 km/h). Time to 10,000 ft (3050 m), 7.5 min. Loaded weight, 2,132 lb (967 kg). Span, 31ft 1 in (9,47 m). Length, 21 ft 9 in (6,63 m). Height, 9 ft 6 in (2,90 m). Wing area, 271 sq ft (25,18 m2).